Frank Darling gathers together the officers of the Chicago Police Department to brief them over the latest disappearance of Dragon. The hero has been missing for two weeks now, ever since he was abducted during the police’s attempts to evict the Underground Freaks. Although Frank fears that the Fiend has finally killed Dragon to take revenge over her daughter’s death, the villainess still blaming him for the murder of Debbie Harris. Bill Ford and many other officers laugh off the concern over Dragon as they are confident he will return sooner or later. Rita Medermade and Alex Wilde remain worried though, fearful that they may have to cope without Dragon. Dragon plummets down into the depths of Hell in the company of Spawn who warns him that they are both dead. Dragon refuses to accept that he is really in Hell and believes that he is merely having a really crazy dream. The two heroes come across a pit of writhing souls and within this throng of people is Antonio Seghetti who notices Dragon and screams for revenge. He struggles free to attack the man who killed him but Dragon simply shrugs him off. Rapture has an appointment with Dr. Plucker at Hillman Hospital who warns her that if her unborn baby really is Dragon’s then she could be in serious danger. When the child gets old enough to start kicking, Rapture could suffer internal damage. She is advised to abort the infant but refuses to as she wishes to prove her loyalty to Dragon and a mere blood test is not enough for her. Howard Niseman goes to visit recovering Phil Dirt in the hope that he can be a character witness for him. It seems that a case of using excessive force is being brought against Howard after he brutally beat the super-freak Oscar into a coma. Chris Robinson is providing an eye witness statement and so Howard is turning to his former partner Phil for assistance. Phil informs Howard that he has problems of his own as he is dying of A.I.D.S. There does not seem to anyway he can survive but Phil would like Howard to secure him access to Dragon’s blood in the hope that its healing properties could save him. The Fiend monitors the progress of Dragon but is disappointed to discover that he is not suffering whilst in Hell. Her sorcerer ally suggests that they actually kill Dragon as transporting his soul may not be enough. The Fiend refuses to take any risk that Dragon was to move onto Heaven and so she demands that she be sent down to Hell too. 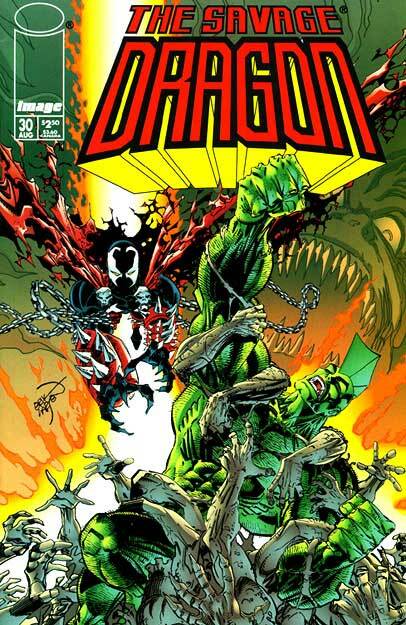 Spawn grows increasingly frustrated with Dragon’s dismissive attitude to their fate and reveals how he was killed a few years ago. He found himself in Hell where Malebolgia made a deal with him to send him back to Earth. Malebolgia tricked Al Simmons though, sending him back five years later and with no memory of his former life. Al’s wife had married his best friend and they then had a child together. When Spawn’s friend Terry Fitzgerald was dying in hospital, Spawn sacrificed his own life by using up his remaining power to heal him. Spawn now finds himself trapped in Hell with Dragon, the pair being left to be bored for all eternity. Back on Earth, Dale Fisher arranges to have dinner with Alex Wilde where he confesses to meeting someone new. He hopes that this news will not upset Alex too much and that although they had something special once, she must move on with her life. Dale’s words are dismissed as Alex points out that they have not seen one another in months. She had assumed they were already over and suspects that Dale has made up a fictional girlfriend in a desperate attempt to win her back. Alex has no intention of reconciling with Dale and tells him to stay out of her life.